Okuma's Serrano Low-Profile Baitcast Reels deliver the silky-smooth performance, lightweight toughness and compact, easy-to-palm design anglers want to have when chasing big fish in either fresh or saltwater. The Serrano Reel's tough ALC (Alumalite Construction Frame) die cast aluminum frame keeps the heavy-duty, Dura brass gearing, drive shaft and other components in precise alignment even with all the stress that heavy-loads and braided lines create. The left, aluminum sideplate is easily removed to allow for quick access to the adjustable 8-position Velocity Control System. "Can't find anything on this reel lacking in quality. I love it, it casts great, is super smooth and the drag is strong. So light and yet you know when you fish it that its very well built. Thanks Okuma for stepping up." "I've used Okuma reels before, and while they weren't junk, they seemed fairly run of the mill. I bought this Serrano because it seemed so smooth and crisp in the store. 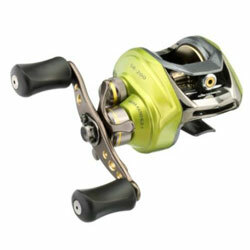 Out on the water the reel proved to be on par with other reels in this price range. " ""I have had a reel from this brand before and the thing fell apart on me......the drag went 1st then the handel wouldnt turn. This reel is a bit better. "